As many of you know, Lyme Regis is one of the most famous and popular UK destinations for fossil hunting. For a lot of people including myself it was our introduction to fossils at a young age. I first visited there as a 7 year old boy with my Grandma, convinced I was going to find my own dinosaur skeleton! However it is not that easy, and despite many trips along that stretch of Dorset coastline over the years I have never been very lucky there. A combination of not knowing the best spots to hunt and the competition of thousands of eyes all looking for fossil treasure makes this beach quite a tough place to do well at. Several factors need to coalesce for a successful hunt (time of year, tide timings, being in the right place and knowing what to look for) and I think it is safe to say that Craig and Steve gave us all the best chance when they arranged the hunt for mid-February on a very low tide with a local expert helping lead us to a great spot and assisting with identifications of the bits we found. It is here that I must thank Brandon Lennon (our local expert for the day) for his time and sharing his expertise with us. Thanks Brandon, you really helped make the day! The hunt was very well attended, and it was great to catch up with some like-minded fossil fiend friends, although I have to admit to having a twinge of paleo-envy when saying hi to Nicky and she bent down to pick up a beautiful tiny ichthyosaur tail vertebra not 6 inches from my foot! Great find! It was a bitterly cold day, about minus 15 I think!! But the Chocosaurs that Sam bought did help some! What also helped was most of us found some really cool stuff. Brandon took us to a stretch of beach between Church Cliffs and Black Ven and the hunt was on. I counted at least 5 ichthyosaur verts of various sizes that were found including a massive one that we had to leave as it was cemented into a block way too heavy to consider carrying off the beach. Sam broke her “ichthy vert virginity” after 4 years of hunting which was awesome. I was lucky enough to find a cervical vert – the first one after the skull (not sure of the scientific name!) and I wasn’t even sure it wasn’t one of those many FSRs (fossil shaped rocks!) but Brandon informed me that it was a cool find. A Plesiosaur vert was also amongst the collective haul which was a beauty. Brandon found a woodstone nodule which he split, revealing a beautiful large partial ammonite and several Promicroceras ammonites. This was a proper Attenborough moment for me as it was the first time I’d seen a nodule split on the beach like this. It might not sound it, but perhaps the most spectacular find was some poo! (fossil poo of course!) Craig had found a small one which whilst cool was overshadowed by the coprolite that Martin Curtis found. The massive and incredibly well preserved coprolite that he found would grace any museum collection. Well done to Martin for that wonderful find. As well as those great finds there were many Belemnites and small Ammonites found too, although I’m not sure how many of those were “take home” fossils! 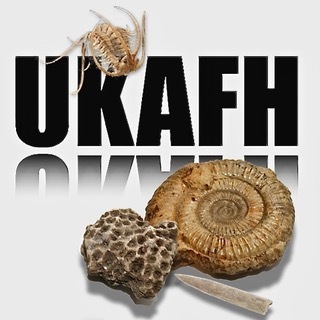 Overall it was a great UKAFH hunt, a pleasure to have been a part of, and one I hope we do again next year. This entry was posted in Reports and tagged charmouth, dorset, lyme regis.